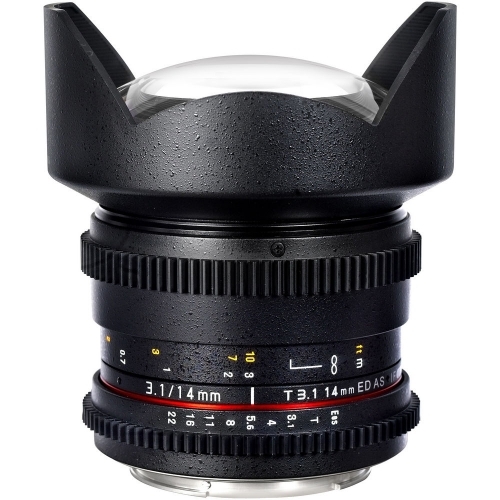 The Samyang 14mm T3.1 Cine Lens is optimized for film and video applications. The focus and iris rings feature industry-standard gearing, which provides an interface for use with a follow focus. To aid focus pullers, aperture and focus scales are marked on the side of the lens. This 14mm lens produces a 115°, ultra-wide angle-of-view when used with a full-frame or 35mm camera. Hybrid aspherical lenses render sharply defined images with a minimum of distortion and chromatic aberrations, and the minimum focus distance is 11.02" from the lens. Some cameras will require that Shutter Lock be disengaged when using this lens.